2) At a black square, turn 90° left, flip the color of the square, move forward one unit. 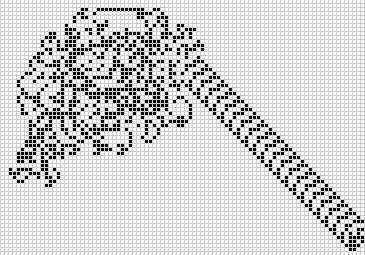 The ant exists on an infinite grid – and is able to travel N,S,E or W. You might expect the pattern generated to either appear completely random, or to replicate a fixed pattern. What actually happens is you have a chaotic pattern for around 10,000 iterations – and then all of a sudden a diagonal “highway” emerges – and then continues forever. In other words there is emergent behavior – order from chaos. What is even more remarkable is that you can populate the initial starting grid with any number of black squares – and you will still end up with the same emergent pattern of an infinitely repeating diagonal highway. 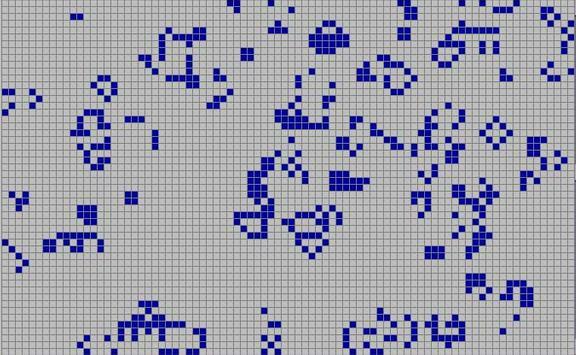 Such cellular automatons are a way of using computational power to try and replicate the natural world – The Game of Life is another well known automaton which starts of with very simple rules – designed to replicate (crudely) bacterial population growth. Small changes to the initial starting conditions result in wildly different outcomes – and once again you see patterns emerging from apparent random behavior. Such automatons can themselves be used as “computers” to calculate the solution to problems. One day could we design a computer program that replicates life itself? Could that then be said to be alive?